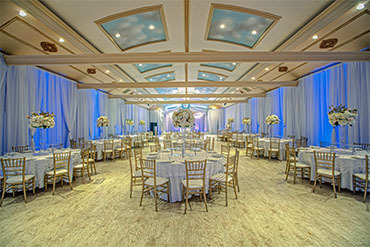 MGM Ballroom is the premier banquet hall in Glendale, CA for events of all types. Don’t expect ordinary from the MGM Banquet Hall. We only deal in extraordinary. The ballroom is a versatile canvas for your event needs. We have updated the MGM Ballroom with a gleaming white dance floor, beautiful white draping on the walls, custom lighting, luxury wood flooring, luxury bridal suite with changing room, head table, beautiful bar and amazing mixologists. We have had the privilege of being a part of thousands of weddings. We include many amenities standard that will help take you plan your event so that you don’t have to worry. Our custom head table is an upgraded feature that we include in every package. Need a place to get ready before you walk down the aisle? We have a full-service bridal suite that is catered and is spacious enough for your bridal party to join you. We can’t wait to wish you and your fiancee congratulations! When it comes time to celebrate your daughter and her coming of age it is important to choose a banquet hall that has incredible customer service and many years of experience. To host a great quinceanera we know that great food and fun are very important. We have adapted our menus to suit your family’s palate and changed our bar package to include nonalcoholic drinks that can be personalized for your event theme with custom titles created by you. Your little one is getting older and you have gathered your loved ones to help you commemorate their first year. With a spacious ballroom, options such as a photo booth and full-service bar the MGM Banquet Hall can accommodate all of your guests. Our versatility in service extends to office luncheons and holiday parties. Each year we are happy to welcome great corporate partners and small offices into our banquet hall for simple meetings or extravagant award ceremonies and more. From bridal showers to baby showers we can transform the MGM Banquet hall for more intimate occasions and recommend some of our preferred vendors for entertainment and those extra special touches. Our photo booth is a sure crowd pleaser and our transportable bar means that you can have the party wherever you want it. What better way to celebrate with your nearest and dearest? We have hosted countless ceremonies in our banquet hall, for weddings and quinceaneras and more. Inquire now about how we can transform your magical day and host the entire celebration at our magical location. Don’t just take our word for it. Our happy clients love us on Yelp and provide us great reviews because they are happy that they have chosen us for their celebratory moments. We are happy to host your wedding, quinceanera, shower, birthday party, luncheon or any other kind of event you can imagine.